Rooms with refrigerator, air conditioning, hair-drier, Wi-Fi and amazing view of the island and the sea, only two steps from the town and a five minute walk from the beach of Mylopotas. 24 hours warm tab water. Free transporation from and towards the port. Family and friedly environment. 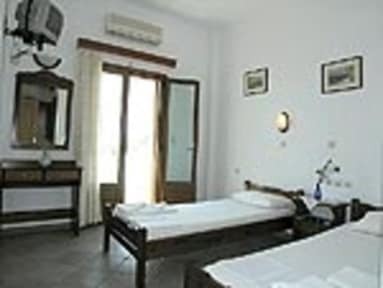 Beautiful rooms situated only 5 mins from the village and 10 mins to the wonderful Milopotas beach, both walking distance. 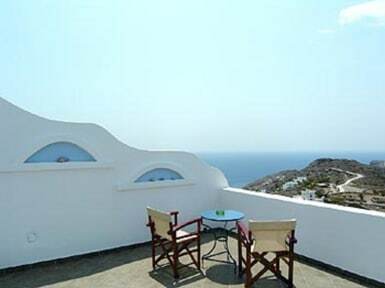 Rooms offer a stunning view of the island and Aegean Sea. facilities include 24 hours hot water, private bathroom, fridge, t.v., A/C and hairdryer. Also free transfer from and to the port. Enjoy a friendly, family, enviroment!